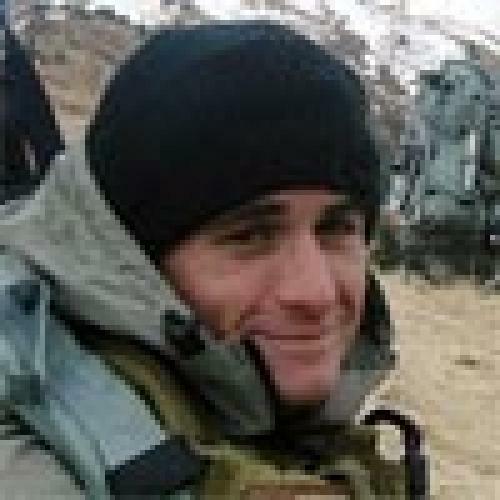 You are here - MILITARY STYLE BOOT CAMP FOR CIVILIANS > Mike Monsoor was NOT EOD. This email infuriates me to no end each time someone sends it to me and Id like to strangle the person who created it. FOR THE RECORD... Mike Monsoor was a NAVY SEAL and NOT an EOD Tech. The grenade was NOT "accidentally dropped" by a Navy SEAL; it was thrown on their position by an Al Qaeda Booger Eater in Iraq, and Mike saved his teammates by jumping on the grenade. It upsets me that Mike is remembered by so many for something he was NOT because of this email and that SEALs are written about as being IDIOTS. Don Shipley BUD/S 131 SEAL Team ONE, SEAL Team TWO. I BET YOU DIDNT SEE THIS IN THE NEWSPAPER OR ON THE 6 OCLOCK NEWS" ~ The Sailor Pictured Below Is, Navy Petty Officer, PO2 (Petty Officer, Second Class) EOD2 (Explosive Ordnance Disposal, Second Class) "MIKE MONSOOR" April 5th, 1981 ~ September 29th, 2006 Mike Monsoor, Was Awarded "The Congressional Medal Of Honor" Last Week, For Giving His Life In Iraq, As He Jumped On, And Covered With His Body, A Live Hand Grenade, That Was Accidentally Dropped By A Navy Seal, Saving The Lives Of A Large Group Of Navy Seals That Was Passing By! 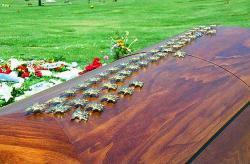 ~ During Mike Monsoors Funeral, At Ft. Rosecrans National Cemetery, In San Diego, California. The Six Pallbearers Removed The Rosewood Casket From The Hearse, And Lined Up On Each Side Of Mike Monsoors Casket, Were His Family Members, Friends, Fellow Sailors, And Well-wishers. The Column Of People Continued From The Hearse, All The Way To The Grave Site. What The Group Didnt Know At The Time Was, Every Navy Seal (45 To Be Exact) That Mike Monsoor Saved That Day Was Scattered Through-Out The Column! ~ As The Pallbearers Carried The Rosewood Casket Down The Column Of People To The Grave Side. The Column Would Collapse. Which Formed A Group Of People That Followed Behind. 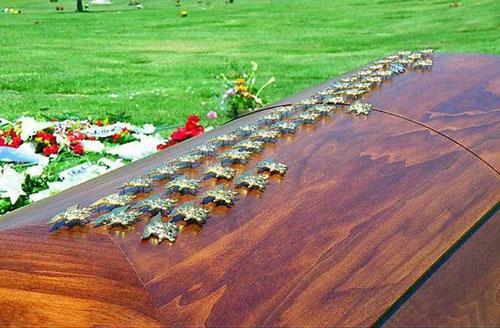 ~ Every Time The Rosewood Casket Passed A Navy Seal, He Would Remove His Gold Trident Pin From His Uniform, And Slap It Down Hard, Causing The Gold Trident Pin To Embed Itself Into The Top Of The Wooden Casket! Then The Navy Seal Would Step Back From The Column, And Salute! ~ Now For Those, (And Me) Who Doesnt Know What A Trident Pin Is, Are What It Looks Like? Here Is The Definition And Photo! ~ After One Completes The Basic Navy Seals Program Which Lasts For Three Weeks, And Is Followed By Seal Qualification Training, Which Is 15 More Weeks Of Training, Necessary To Continue Improving Basic Skills And To Learn New Tactics And Techniques, Required For An Assignment To A Navy Seal Platoon. After successful completion, Trainees Are Given Their Naval Enlisted Code, And Are Awarded The Navy Seal Trident Pin. With This Gold Pin They Are Now Officially Navy Seals! It Was Said, That You Could Hear Each Of The 45 Slaps From Across The Cemetery! By The Time The Rosewood Casket Reached The Grave Site, It Looked As Though It Had A Gold Inlay From The 45 Trident Pins That Lined The Top! This Was A Fitting End To An Eternal Send-Off For A Warrior Hero! This Should Be Front-Page News! Instead Of The Garbage We Listen To And See Every Day..
"GOD BLESS AND KEEP OUR TROOPS SAFE!